Government scientists go rogue. What a great idea! Government scientists are very worried, apparently with good reason, that their new boss wants to muzzle them. They've just come up with a brilliant strategy to circumvent this attempt at censorship. Donald Trump and his minions have already made moves to suppress science within the government, with word going out that government employees cannot say anything to the public without the prior approval of political appointees. This has the marks of Stalinist (or should I say Putinist?) repression of free speech, not the sort of thing any of us ever expected to see in the United States. However, after running a campaign marked by outrageous anti-science claims on climate change and vaccine safety, Trump appears on track to use the enormous power of the federal government to suppress basic scientific facts. Vladimir Putin has done the same thing. Most Russians think that Malaysia Airlines Flight 17, which was shot down in Ukraine in 2014, killing all 298 passengers, was shot down by Ukraine–despite the overwhelming evidence that the plane was shot down by a Russian missile provided to Russian-backed separatists by Russia. Putin had a record of suppressing, threatening, and even murdering those who speak out against him. Yet Donald Trump seems to find him the most admirable of all world leaders. And one of his closest advisors, Newt Gingrich, has said that he wants to fire all federal workers who didn't vote for Trump. In just the past few days, though, government scientists have come up with a devilishly clever–and entirely legal–strategy to oppose the Trump administration's efforts to suppress their speech. Using Twitter, the same vehicle that Trump himself used so effectively throughout his campaign, they have created a set of "rogue" and "alt" accounts that have already started tweeting the real news about science, medicine, and the environment. As one tweet already pointed out, quoting the ACLU, "the First Amendment still protects workers' ability to speak in their own private capacities, on their own time, about matters that concern the public." We might not be able to trust any official statements from the government for the next few years, but perhaps we'll still be able to find accurate science through the alt-gov Twitter accounts. So when you hear the Secretary of Health and Human Services (far right Congressman Tom Price, if he's confirmed) making claims about health care, check out @AltHHS to find out the real story. And when you hear Secretary of Big Oil Energy Rick Perry claim that global warming is a hoax, go to @NotAltWorld or @RogueNasa to find out the real story. Trump's lovefest with anti-vaxxer RFK Jr.
and Donald Trump's new best friend. Anti-vaccine conspiracy theories make for strange bedfellows. Witness this past week's widely reported meeting between Donald Trump and liberal activist Robert F. Kennedy, Jr. to discuss vaccines and vaccine policy. RFK Jr. emerged from the meeting to claim that Trump had invited him to chair a new commission on vaccines, specifically to discuss the thoroughly discredited claim that vaccines cause autism. Talk about the blind leading the blind. Trump has been an anti-vaxxer for years (as I've pointed out before), but for him it seems more like an afterthought–yet another of the many false claims he likes to throw out at random moments. RFK Jr., in contrast, has made anti-vaccine conspiracy mongering his raison d'etre for many years, most recently when he published an entire book to promote the bogus theory that thimerosal causes autism. Just to get this out of the way: vaccines don't cause autism. (If you want details, here's a nearly book-length article that explains more.) The thimerosal used as a preservative in vaccines was removed a decade ago (in an excess of caution), but that never caused autism either. Because of one bogus, now-retracted study published by Andrew Wakefield in 1998, millions of dollars have been spent investigating–and ultimately disproving–any possible link between vaccines and autism. All that money could have been better spent trying to find the real causes of autism, but it was wasted instead in an effort to undo the damage caused by one fraudulent doctor, Wakefield, who eventually was found to have committed fraud and lost his medical license. Autism is a complex disease with a strong genetic component, and thousands of devoted scientists are trying to understand it better. RFK Jr. is not one of those scientists. He's a lawyer who previously devoted himself to environmental causes. He's also a ideologue who is all too willing to distort the facts and simply make things up if it suits his agenda. He and Trump share that particular style of discussion. So back to this "vaccine commission" that RFK Jr. wants to lead. Besides the blindingly obvious fact that RFK Jr. is completely, utterly incompetent to lead such a commission, he and Trump also seem unaware that the U.S. already has a vaccine commission. It's called the Advisory Committee on Immunization Practices, and it's filled with medical experts who have spent their lives studying vaccines and vaccine safety. It also includes a consumer representative, and it is completely open, despite the conspiracy-mongering protestations of RFK Jr. If you want to see who's on it, just look here. The ACIP meets three times a year, its meeting schedule is also posted on the website, and the meetings are open to the public. Cleary RFK Jr. loves the attention he's getting from Trump. And Trump seems to have found a soulmate in his fellow anti-vaxxer, despite RFK's strongly liberal political views. After the private meeting and RFK's announcement that Trump had invited him to chair a vaccine commission, Trump's representatives denied it. 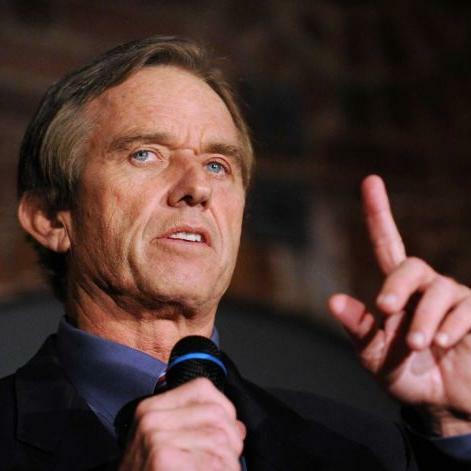 But a day later, RFK Jr. announced that he was leaving his environmental group in order to chair this hypothetical "vaccine safety" commission, and he also claimed that he and Trump had been discussing it for a month. Putting Robert F. Kennedy Jr. in charge of a commission on vaccines is akin to putting Josef Stalin in charge of prison reform. By insisting that vaccines cause autism, both Trump and RFK Jr. have already ignored a vast body of science that shows vaccines to be not only safe, but perhaps the single greatest benefit to public health in the history of medicine. If Trump gives RFK Jr. a platform to spout his anti-vaccine nonsense, the two of them will set back healthcare by decades. Infectious diseases such as measles will return with a vengeance, and children will die. That will be an awful outcome, and no one–not even Trump or RFK Jr.–can possibly want that. Let's hope that someone in Trump's inner circle stops him before this goes any further. Fake news has been in the news a lot lately. Fake news proliferated wildly during the 2016 U.S. election, much of it completely fabricated, usually with an extreme partisan bias. Fake news is corrosive. It mis-informs the public, divides people against one another, leads to bad policy decisions, and can even induce people to take action against imaginary threats. One might think that medical literature is immune from this kind of fakery, but it's not. Recent years have seen the appearance of journals from mainstream publishers that are based entirely on pseudoscience. On the surface, these publications look and act just like real scientific journals, but it's all just pretend. The publishers of these journals presumably care more about their bottom line than about scientific integrity. They know (or seem to know) that journals about pseudoscience will create a never-ending demand for fake breakthroughs and science-y sounding studies that are built on a house of cards. I've decided to start out the new year by calling out these fake medical journals for what they are: complete and utter nonsense. First, a bit of background. Imagine for a moment that a publisher created a Journal of Magical Medicine under the rubric of a large, respectable publisher–for example, Elsevier. After assembling an editorial board of academics from legitimate universities who believed in magical medicine, the journal started soliciting and reviewing papers. The editors would send any submissions for review to other academics who believed in magic, and over time a steady stream of peer-reviewed papers would emerge. A large network of magical medicine "experts" would develop, reviewing and citing each others' papers, and occasionally writing review articles about the state of the art in magical medicine. Dr. Harriet Hall has accurately called this "tooth fairy science." I prefer to call it "cargo cult science," because its practitioners mimic the behavior of real scientists without actually understanding science itself. Of course, no self-respecting scientist would want to waste his or her time reading garbage, so most scientists would simply ignore the Journal of Magical Medicine. But it would persist anyway. These aren't the only ones, but they'll do for an illustration. I can't help pointing out that the Elsevier journal has a bonus bit of magic in its name: "meridians" are a completely imaginary concept, referring to invisible lines of energy that supposedly flow through the body. This is a perfect (if unintentional) example of magical medicine. How nice that Elsevier provides a journal for people who want to study it. "Potential authors ... are invited to suggest their preferred reviewers who subsequently are almost invariably appointed to do the job.... As a result, most (I estimate around 80%) of the articles that currently get published on alternative medicine are useless rubbish." If anything, Prof. Ernst is being overly generous. Looking over the articles published in the latest issues of these journals is painful (if you care about good science, that is). For example, the BMJ acupuncture journal features "Needling depth at BL52 in 13 cadavers," an article about inserting needles into dead bodies. Why study this? Because (as the paper explains) acupuncture needles can damage the kidneys if they are inserted too deeply. Here's another example, from Elsevier's acupuncture journal: "Effect of Manual Acupuncture Stimulation at `Bai-Hui' (GV 20) or `Yintáng' (Ex-HN3) on Depressed Rats," a study that concludes that acupuncture helps alleviate depression (in rats, mind you!) but only if you use two acupuncture points simultaneously. Right. There are thousands more articles like these. It's an entire ecosystem of pseudoscience. Let's be clear: acupuncture is "a pre-scientific superstition" that has no basis in medicine, physiology, or biology, and has never had any good scientific evidence to support it. It wasn't even popular in China until Chairman Mao re-invented it as part of "traditional Chinese medicine." Mao did this because China didn't have enough real doctors to treat its large population, and he wanted to convince the masses that their local herbalist was offering something just as good. China is still pushing this today, for the same unscientific reasons. I've been advised that I should treat acupuncturists and acupuncture believers with respect, and that I should accept that they have some legitimate claims because some patients like them. I've tried this approach, and it doesn't work: acupuncture continues to spread, in part because of very badly-done studies that often misrepresent their findings. I've read enough acupuncture studies for one lifetime, and acupuncture doesn't work for anything. It's nothing more than an elaborate, theatrical placebo, performed by quacks to convince unwitting victims patients that the acupuncturists have something real to offer. They don't. Trying to refute the claims of acupuncture (see here and here, and again here, for example) is like playing whack-a-mole. Proponents claim it cures dozens (or hundreds) of different conditions, and each time a claim falls flat, they simply make up a new one. Acupuncture also carries small but real risks to patients, who can suffer infections and sometimes much worse, such as punctured lungs. Elsevier, BMJ, and Biomed Central should be embarrassed to publish these fake medical journals, which serve only to promote pseudoscience. Their very existence can confuse medical students, who assume (as they've told me themselves) that if legitimate-looking journals are publishing this stuff, there must be something to it. Despite their appearances, the Journal of Acupuncture and Meridian Studies, Acupuncture in Medicine, and Chinese Medicine are not real medical journals. They are fake journals filled with fake science, and the world would be a better place if they all disappeared.